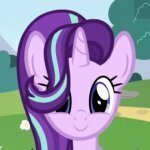 Are we forgetting that Starlight and Spike staged a somewhat elaborate act to try and snap her out of it? I think that's exactly why they did it. Especially since its still a kids show. Some comic relief to keep the grimdark from getting too heavy handed. Even Shakespeare strategically placed comic scenes in tales such as Macbeth, to give the audience a break from the gloom.